About the book: Hannah has made her decision. Now an outcast from her own people, injured and weak, she must make the trek alone to find her prophet and those who have followed him. But miles of wilderness separate them. Does she have the strength to continue? And even if she succeeds, will she and others who share her faith survive the inevitable war between brothers? My review: I loved that Hannah gets another book! The last book, Daughter of Ishmael, left us hanging as to Hannah’s fate after she was stoned by her own family. This book starts right where that one left off with Hannah in just as much danger. I loved Hannah. She is really resourceful and able to take care of herself and those that end up entrusted to her care. I also loved that things weren’t quite as Hannah had thought they were. There were more living in King Laman’s settlement that felt as she did that Nephi was a prophet and that they needed to follow him. There was almost constant danger for Hannah during her travels. From the camp of Laman camping in exactly the same place she was hiding while she recovered, to a bear sighting, to a flash flood. Lots of excitement for her. I liked that the whole book is from Hannah’s point of view. She really has a unique perspective, because she had been married to Lemuel, she knew how Laman’s camp operates and the lengths they are willing to go to get what they want. But she is a righteous woman, who wanted to follow Nephi, even when her family and everyone around her didn’t. I really liked the plot of this one. The time period this book covers is significant, over 15 years. The author did a really great job showing the passage of time and not making the book confusing. If you like historical fiction, and you’ve always wondered what could have been happening during this time period in the Book of Mormon this one’s for you! About the author: Raised on a ranch on the great Canadian prairies, where normal life included–but was not limited to–a loaded civil war cannon used as a counterweight on the garage door, and at least one headless chicken, Diane Stringam Tolley has been penning stories since Mrs. Hainsworth’s grade six class. Her working life as a journalist was spent writing other peoples articles and stories. Now, in retirement, she writes her own. 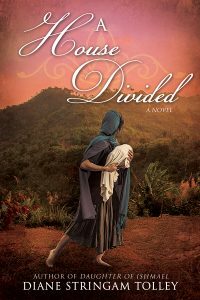 A House Divided is her 11th novel. This post contains affiliate links, which simply means that if you click my links and make a purchase, I may receive a small commission from your purchase.